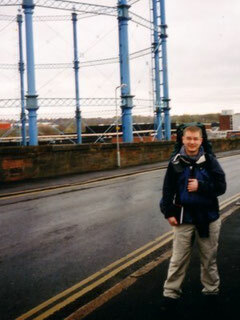 The Cumbria Way, April 2004. - office23s jimdo page! 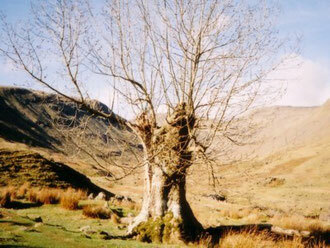 The Cumbria Way, April 2004. A walk from Carlisle to Ulverston and passing through the heart of the Lake District. 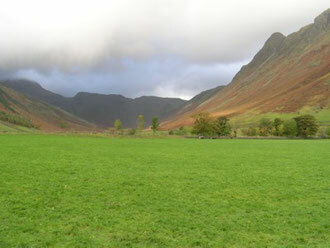 Mainly a low-level walk, it is designed to show a great variety of landscapes within the county of Cumbria. The train pulled into Carlisle station over half an hour late and I'd left the first map we needed at home - not the most auspicious of beginings. We had descided to attempt the trek in reverse to the usual prescribed route, perversely with a theory that we'd be going 'down hill' and not have the Skiddaw Massive to tackle on the final day. The urban gave way to the suburban and then to the countryside, the first day carrying heavy packpacks is always pain as all the straps, belts and buckles are constantly adjusted until comfortable. We finished the day in the growing gloom of the night after walking through a forested hill slick with mud. Unable to locate 'The Briars' our bed and beakfast for the night we wandered the streets of Caldbeck asking those we met for directions only to be told they too were tourists. Eventually a kind, knowledgable local pointed us in the right direction. Showered, we collapsed upon the soft beds; the next few nights would be spent under canvas. We ate a hearty full breakfast and left the comfort of 'The Briars' for the back o'Skiddaw. The road we walked passed over rolling and tumbling farmland gradually gaining height until spilling out onto the Caldbeck Fells. 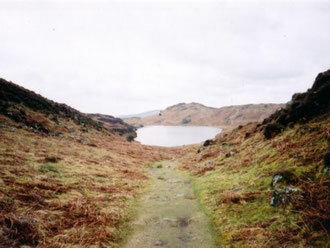 We staggered slowly up the steep flank of High Pike picking our way through the mine workings and sinuous small becks. We stagered to the summit and rested on the bench there celebrating with chocolate bars and water, big events in history are celebrated here by the building and firing of a beacon. 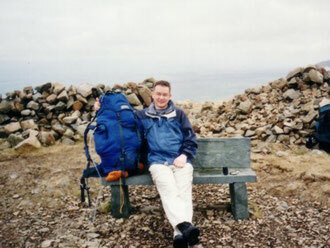 Wainwright in his guide to The Northern Fells informs us that the bench is dedicated to Mick Lewis, a youth of Nether Row, "who loved all these fells". At 2157' High Pike marks the greatest altitude ascended on our trek. We descended towards Keswick, our fatigue growing as in the distance the street lights of the town flickered on, we bid hello to those we passed including a man best described as 'Gandalf on a bike', perhaps I was tired and lapsing into hallucinations! Absolutely knackered we walked the streets until finding near the rugby pitch the Derwent Water Camping Site. We set up the tents, cooked up a brew and ate hot food; we shared a packet of dried apricots and with our backs to a tree looked out upon Derwent water. 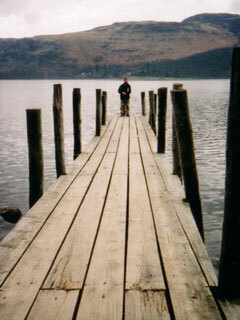 Broadest of the lakes, Derwent Water is renowned for its tranquility. Eminently charming, it is regarded as the Queen Of Lakes and remains a regal aristocrat in all seasons. A feature of Derwent Water is saint Herbert's Island, the site of a hermitage inhabited by the seventh century Saint Herbert, renown as a major ecclesiatical figure in the dark ages. Wordsworth was impressed by Saint Herbert expressing his his regard poetically: "... a self-secluded man. After long exercise in social scares, and offices humane, intent to adore the diety with undistracted mind, and meditate on everlasting things in utter solitude". Our route followed the path in warm sunshine south between the shores of Derwent Water and the heights of Cats Bells. We walked out onto Borrowdale following the course of the River Derwent, passing through Rosthwaite and stopping at the pub in Stonethwaite to eat lunch before walking on to the campsite. The Langstrath Inn features in the Lake District section of Ian McEwans Booker Prize winning novel Amsterdam (1998), the Langstrath valley is described as "one long frown set in stone" and is walked by McEwans character, Clive Linley. A great days walk alone in a most magical of places, McEwan's description being inacurate and cruel. The watershed of Stake Pass is a tough climb but we were getting used to walking with heavy packs now, it was here that we met the first other human soul of the day. We had seen plenty of sheep earlier in the day including passing a long caravan of tough looking mountain sheep, we resisted the temptation to count them. The Old Dungeon Ghyll Hotel was a welcome site and we drank beer and ate a lunch of fish and chips there before establishing ourselves at the Great Langdale National Trust Campsite, the showers, toilets and shop were most welcome. More beer and food at The Old Dungeon Ghyll Hotel rounded off a good day. A day walked in drizzle, mist and rain - the first and only of the journey. We ate lunch at the highly recomended Black Bull Inn on the Yewdale Road and sampled its fine beers - Good Old Man, Coniston and Bluebird. The beers recall the tragedy that befell Donald Campbell on the waters of the lake in January of 1967. Having set out to better his own record Campbell in his jet-powered boat Bluebird, he hit a patch of turbulence at an estimated 320mph which sent the craft into a somersault. Campbells shoes, helmet, oxygen mask and teddy bear mascot were recovered from the water. His body and the wreckage of Bluebird were recovered some thirty-five years later. Coniston Water is said to be the 'plainest' of the lakes. At the end of the nineteenth century Arthur Ransom used to spend his summer holidays here and was "half-drowned in tears" when it was time to leave. Vivid memories of these times spent around Coniston Water were delightfuly recalled in the childrens classic novel 'Swallows and Amazons." still on a literary bent the famous Victoian art critic John Ruskin once described Coniston Water as being "more beautifull than anything I had ever seen to my rememberence in gladness and infinitude of light". Not quite half-drowned in tears we departed the campsite at Coniston Hall and headed out on our last days walking to Ulverston. Torver lies three and a half miles south-west of Coniston, and though a chapel came with the founding in the twelfth century of the priory of Conishead, it was not consecrated as a church until 1884. Before that date, the dead had to be carried the sixteen miles to Ulverston for buriel. It was on the ghost of this corpse road that we came to complete our journey and find our rooms at the Virginia House Hotel on Queen Street, hot water, clean sheets and a mighty big breakfast the following morning.